Horsham will make a second attempt at running an under-23 side next season and they will be managed by a former club captain. The Hornets will be entering a side in the Isthmian Under-23 Development League with Mark Hawthorne taking the helm. 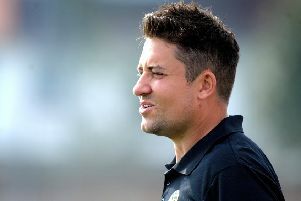 The Hornets’ former skipper and assistant manager, who holds a UEFA B coaching qualification, will take charge of the reformed side after attempts to run one this year were abandoned. The intention to run club’s first-ever under-23 side was announced last summer and Bryan O’Toole - brother or Horsham striker Rob - was installed as the manager. The side, however, found life difficult in the Bluefin Development League South suffering seven defeats from seven games. They were severely hindered by a lack of training facilities with the original idea that the club would be at least training their new Hop Oast home by late last year. Delays meant that was not possible and as a result, the side was folded in October. There is renewed optimism that with their new facilities providing a training and match base, the under-23s can now make a successful go of things. First team manager Dominic Di Paola has often spoken of how they are hindered by keeping fringe players match fit and also having a reserve team to call on, something that the under-23s will provide. A club statement said: “Matches will be played at Horsham’s new Hop Oast Stadium and will offer promising young footballers the opportunity to progress their careers in the sport at a senior club. “Mark will work closely with first team manager Dom Di Paola to support the senior side, with squad players able to get regular game time within the club.